Our New Building - Welcome to Critter Camp! Be a part of Critter Camp's GREEN Sanctuary Building! We are Very Excited to have contracted with Animal Arts, a nationally recognized animal facility builder, to provide a Needs Assessment and Site Plan four our new building! See the reports - click here! Thank you to Matthew Olson and his scout troop for creating and putting up this sign! The new facility will give a home to approximately 1,000 abandoned, abused companion animals at any given time! We are offering beautiful high quality porcelain Engraved Tiles to be displayed in the entry way of the building! Hurry NOW and order your TILE-click here!! All tiles will be ash gray with black infill and will be strategically placed on the interior walls as you enter the new facility and on the information desk base for maximum exposure. Interior tiles were chosen over bricks so they will be visible year round, never obstructed by snow cover. This purchase will be a one-time cost. There are no annual fees and your tile will be there for many years to come. Set aside a bit of your tax refund to honor your family, a pet, a relative or friend. Give your business exposure to thousands of animal loving visitors, tourists and local residents. 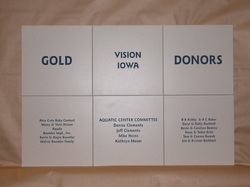 A donor tile makes a great gift too! Tile purchases will be acknowledged on our new Building Benefactor Page here on our Critter Camp website and progress will also be posted. Businesses purchasing tiles will receive a LIVE link on our benefactor page too. As funds are raised work will begin. First the utilities will be connected, then site preparation, etc. footprint! Which will also keep operating costs down too! ***May create the First ever Public Rabbit & Ferret exercise parks! • Open to the public 7 days a week from 10 am to 8 pm for viewing only, guided hands-on educational tours available Fridays, Saturdays & Sundays every two hours, and during the week by appointment. Great destination for tourists, and field trips for schools, scouts etc. • Suggested donations amounts upon entering, set fee for hands-on tours. In order to move forward we are resuming our pursuit of building sponsors. We are considering grants, crowdfunding, Corporate and individual sponsors.